Pinterest has continued to help the design industry evolve, since it’s shown people that the grid and masonry styles are not only organized, but they are functional and beautiful. Building your own website almost always requires you to implement at least one or two grid-based elements, whether you include a portfolio, gallery or list of coupons. Regardless, you’ll have to choose between grid, masonry or Pinterest-style WordPress themes. 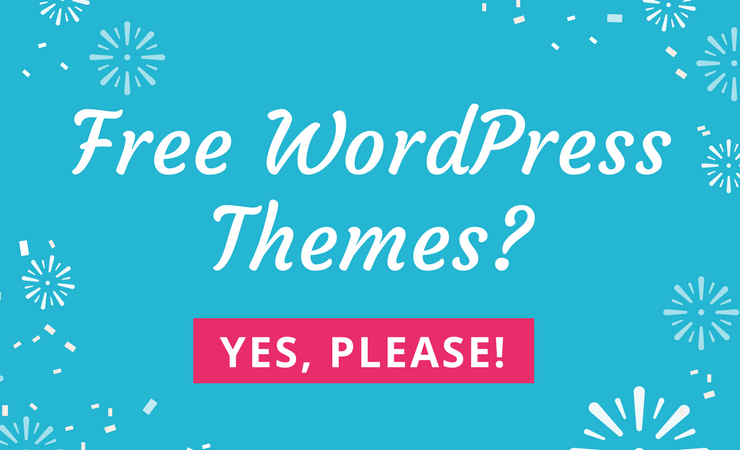 Unfortunately, hundreds, if not thousands of WordPress themes utilize the grids such as the Pinterest-style layout, making it nearly impossible for you to sift through the options. Luckily, we put in the work for you, outlining which of the top WordPress themes combine their functionalities with grids and masonry displays. Keep in mind that some of the themes almost look completely like the Pinterest website, while others are more focused on making the layout look normal, with a few grid-based elements along throughout the design. 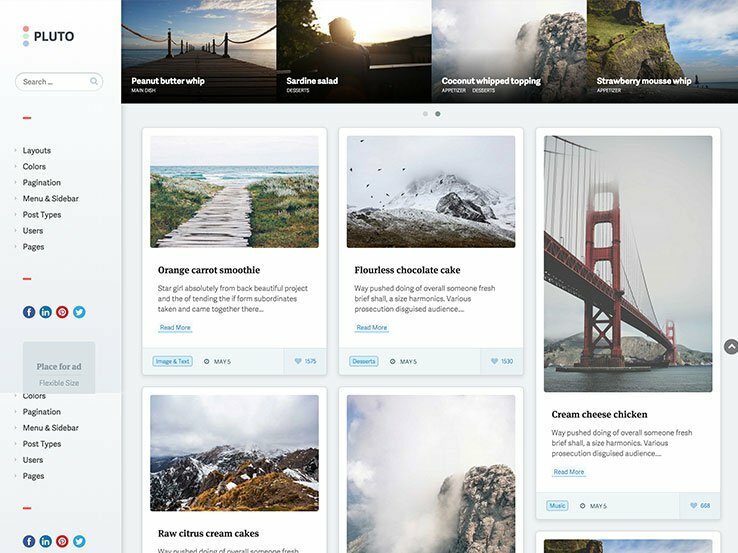 Pinterest-style themes allow you to present your content in a structured manner. Most of them come equipped with the infinite scroll feature which allows more of your content to be seen as your visitors scroll further down the page. They also feature images above the content which are a great way to draw your visitors in and encourage them to click through and read your article. Responsive design and customization options should be present no matter what type of theme you’re looking for so you can easily brand your website and rest assured it will display great on any device. 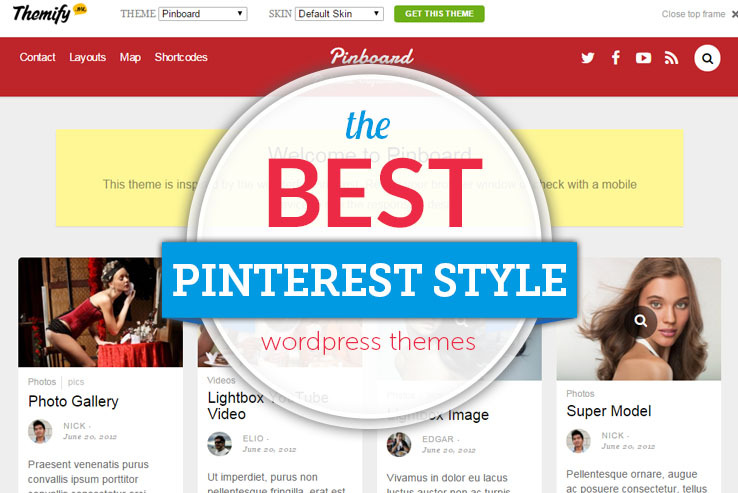 Pinterest-style themes can adapt to a variety of niches. They allow you to stand out from the competition and catch the attention of your visitors. As such they are a great choice for anyone who wants to showcase a lot of content in a clear and visually appealing way. 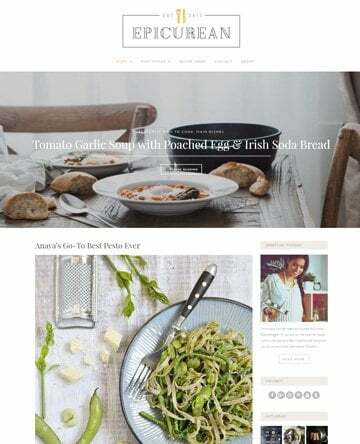 Whether you’re a lifestyle blogger, creative agency, freelancer, photographer, travel blogger, or a food blogger, a Pinterest-style theme is a great way to showcase your recipes or your portfolio in a creative way. Without further ado…keep reading to learn about the best grid, masonry, and Pinterest-style WordPress themes. Start your search with the Pinboard theme since it provides a homepage that looks almost identical to the Pinterest social network. The Pinboard theme is completely responsive, which is nice for those users who want to view your website on mobile devices. It has an auto stacking layout, meaning that depending on the size of your device, the theme adjusts to having one, two, three or four columns. This all depends on how much space the theme has in terms of width. The high-resolution display offers an infinite scroll so that you can add as much content on your homepage as possible. Play around with multiple grid layout options to make your grids larger or smaller. You can customize a welcome message to explain what people can do when they land on your site. Publish various types of content such as videos, images, audio, and more. Each post is displayed as a module in the grid and you can see the top five comments for each post, without leaving the homepage. An author picture is revealed under each post, giving credit to the person who wrote it. 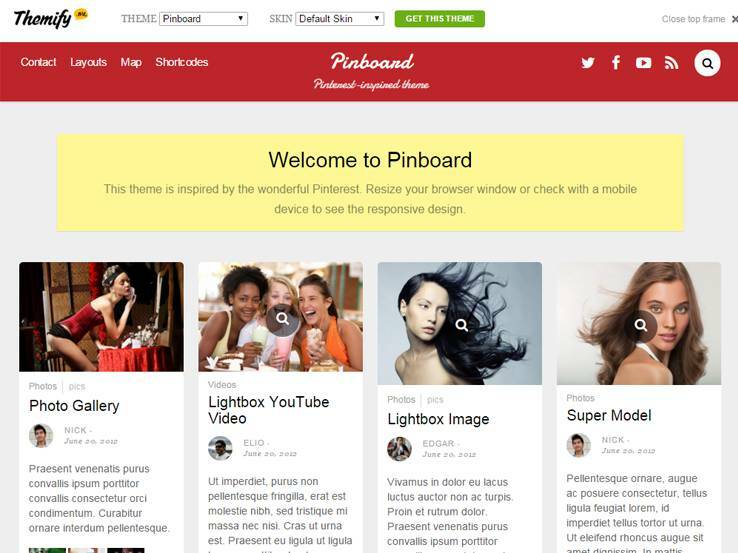 Along with a beautiful drag and drop builder, Google Fonts, and WooCommerce integration, the Pinboard WordPress theme powers a site without limitations. 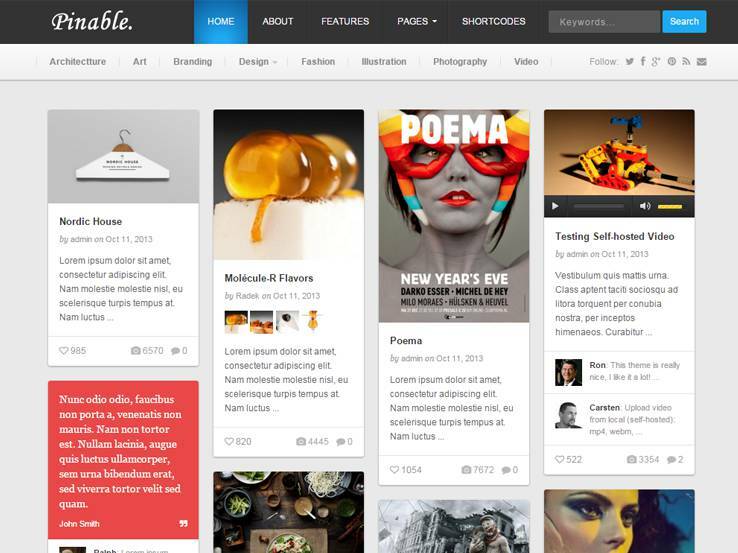 The Pinable WordPress theme has the similar Pinterest-style layout, which obviously goes along with this article. Two navigation menus make navigating your website easy, while various social media buttons send people to your other platforms without taking up much space on the page. Each grid module adjusts in size depending on the type of device you’re using, while the length of the modules varies depending on how much content is in the description. Infinite scrolling is one of the main reasons people choose this theme, considering you can fit all the content you want on a single screen. Pinable is responsive, meaning it can work on just about any mobile device such as a tablet or phone. Quite a few widgets allow you to take your website to the next level. A search bar works nicely for helping people navigate your website and boost your search engine rankings. 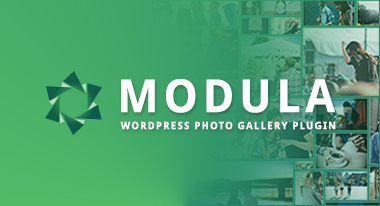 Each module in the homepage grid has additional buttons that allow for liking, viewing posts, and even commenting on the post. 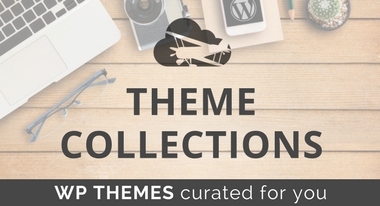 Check out the Pluto theme if you’re interested in one of the highest rated personal blog themes from ThemeForest. Here’s a theme that looks similar to Pinterest, yet the navigation menu is a bit more minimalist. The membership features are included for building a community and allowing for elegant profiles. Users can publish posts and upload photos, while also messaging and following other people. You can even protect your photos from being stolen and earn money with your blog by posting ads throughout the several ad spots in the widgets areas. The theme comes with various sidebar and menu positions, making it easy to stand out from the competition. As stated above, the navigation menu is a little smaller than Pinterest, and that’s because it becomes compact when someone scrolls down the page. It’s worth noting that the entire Pluto theme is completely responsive. Eight post formats allow you to include posts containing audio, video, and more. Pluto is translation ready, allowing you to translate your website into any other language. Along with that, several social sharing buttons allow you to build your social following and bring more people to your blog. 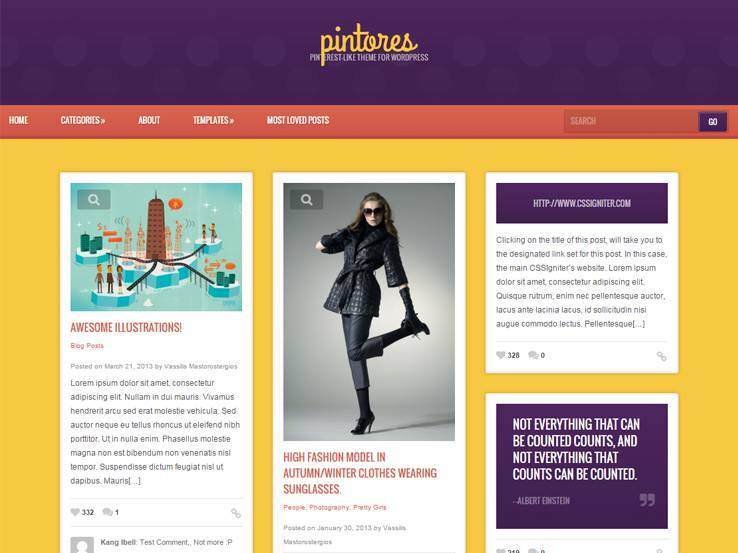 The Pintores theme provides a more colorful version of Pinterest, with responsive elements and beautiful grid-based modules for making your website into something that mimics the famous social network. A search bar sits at the top of the page for guiding those who come to your site. The Pintores WordPress theme has a responsive design for looking wonderful on smaller devices. You can upload your own logo that sits in the center of the header, while also customizing the navigational menu to improve how new visitors can move around your site. Infinite scrolling offers a nice way to fit tons of content on your homepage. Drive user engagement by including a “favorites” button on each of the grid modules. In theory, each of these modules is built to lead your visitors to a blog post. Your visitors will be able to see comments, likes, and featured images when the posts are arranged in such a grid-based format. Keep in mind that translation features are packed into the Pintores theme as well, expanding your reach and connecting with an international audience. 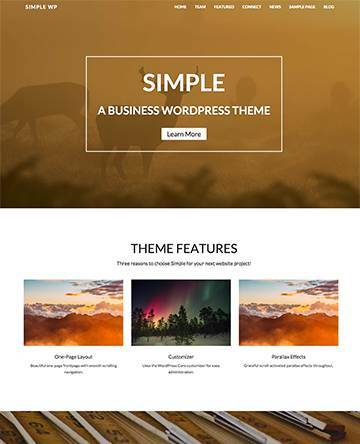 The Luna WordPress theme provides a wonderful layout for showing off your work or selling online. In fact, the theme is ideal for a standard business website, but it still includes an area with a grid layout. 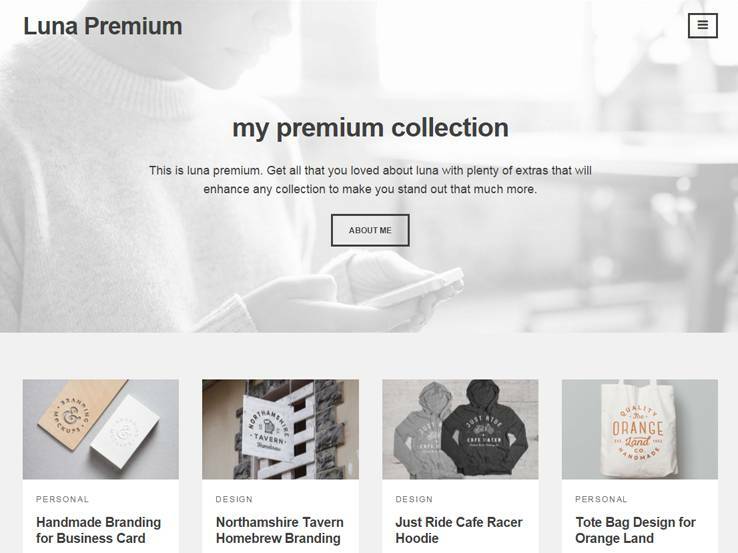 In terms of features, the Luna theme has the ability to integrate with WooCommerce, which makes it easy to add an online store to your website. Consider selling anything from digital goods to physical products. Various widget areas are offered in the sidebars, making it easy to implement widgets and drag and drop them where you want them to appear. Plugin compatibility is off the charts, and the responsive layout helps people view your website on all mobile devices such as tablets and phones. Up to five different sidebars are available, enabling a layout that caters to those with lots of content to share. The Google Font selector is a unique tool, since you can quickly customize the fonts on your website. As we stated before, several plugins are compatible with the theme. 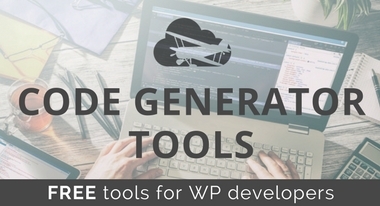 Some of these plugins include Services, Clients, Team Members, Skills, Maps, and Details plugins. Each of these plugins is free and developed by the folks at ModernThemes, so you know that they work perfectly with the Luna theme. Several tutorials and videos are included with your purchase and the PSD files assist those who truly want to find the ultimate customization atmosphere. Put this theme on your list if you’re interested in power and style. Many webmasters choose the Semantic WordPress theme for its responsive and clean layout, but we’re highlighting it for the Pinterest look. The majority of your articles are presented in a grid format, and each of these show links, descriptions, and images. 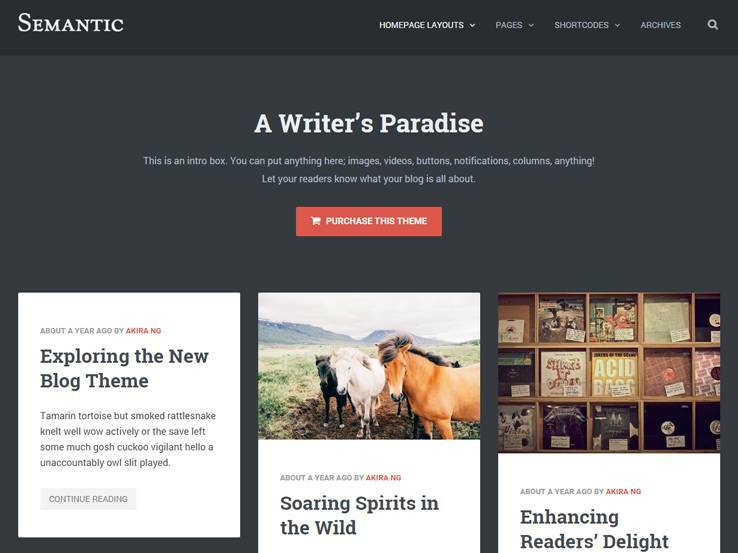 Besides the grid, Semantic offers several custom homepage layouts to choose from, besides the fact that you can customize the widgets and blog grids. The right and left sidebars are essential for implementing widgets on the homepage, and throughout the entire site. If you’d rather have a wide layout, remove the sidebars for more real estate on the screen. Three beautiful skins help out with customizing your site, while 20 background options ensure that you can upload an image that reflects your brand. 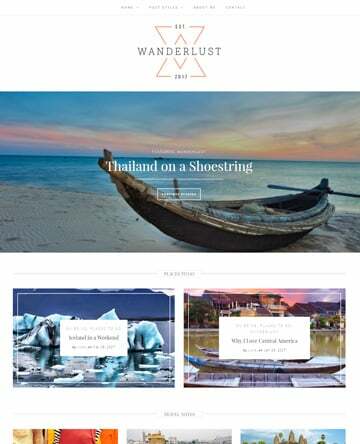 The Semantic theme comes with gorgeous typography, which helps with presenting your content in an elegant way. You can choose between Facebook or Disqus comments. Both are nice, but one is more social, while the other has a strong community behind it. Forgetting to mention the shortcodes would be a huge disservice to you because these items are wonderful for adding columns, buttons, tabs, and more. The best part is that you don’t ever have to go into the source code files to make the changes. Even beginners can get the hang of shortcodes and learn to use them throughout the website. The header offers an area to have text, along with a click-through button. It works nicely for a call-to-action, while the navigation menu guides users through the site. Next to the menu you’ll find a search bar for those who know exactly what they’re looking for. Along with social media buttons, several post types, and a footer with widget support, the Semantic WordPress theme is packed with features. Pinfinity is a stunning, minimalist theme featuring a grid layout. It has an infinite scroll option which instantly loads more of your content as your visitors scroll down. A nice detail is the Love button which allows your visitors to show appreciation for your content. Pinfinity supports various post formats and makes each of them stand out in their own unique way. The rest of the pages on your blog can be setup to take up the full width of the screen or as a single column. The customization options of Pinfinity theme do not disappoint. You can use their theme options panel to customize every aspect of your theme. Upload your own logo, change colors, customize the typography, and much more. Google Analytics code can easily be inserted so you can accurately track your page views. Every page and post come with their own set of special options which is controlled from the theme options panel. Additionally, Pinfinity is fully responsive and optimized for fast loading times. 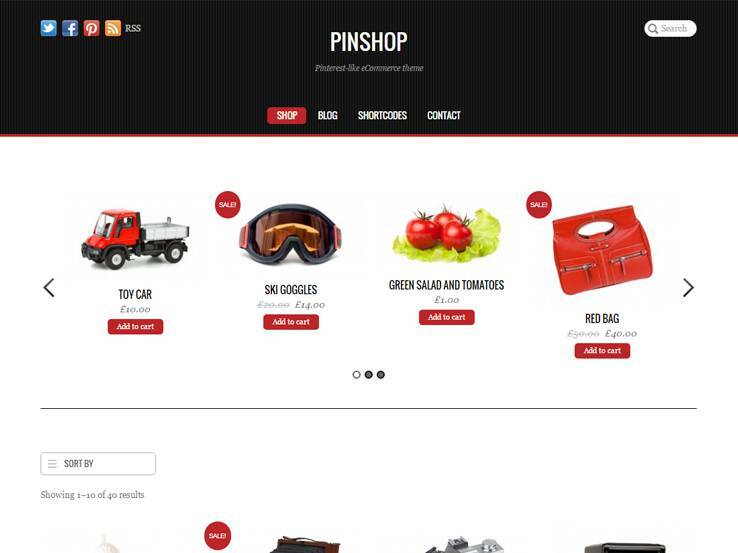 Pinshop is a great example of a Pinterest-style theme adapted for an eCommerce website. The front-page displays all your products in a grid layout similar to Pinterest and as visitors scroll down, more products come into view. Pinshop provides a great user experience because potential buyers can browse your products easily without having to click through multiple pages of your shop. The products stack nicely on top of each other and when you resize the page, they are automatically re-positioned. The shop items can be added to the cart instantly without having to go to the product page. Pinshop is powered by Themify framework which gives you access to their powerful page builder and plenty of other customization options. You can customize the layout of any page and create a completely unique and custom layout. Every aspect of the theme from the header to the footer can be customized and tweaked with a few simple clicks of a mouse. Pinshop also includes social features for growing your following and sharing your content easily, as well as SEO control which allows you to improve your rankings in search engines. 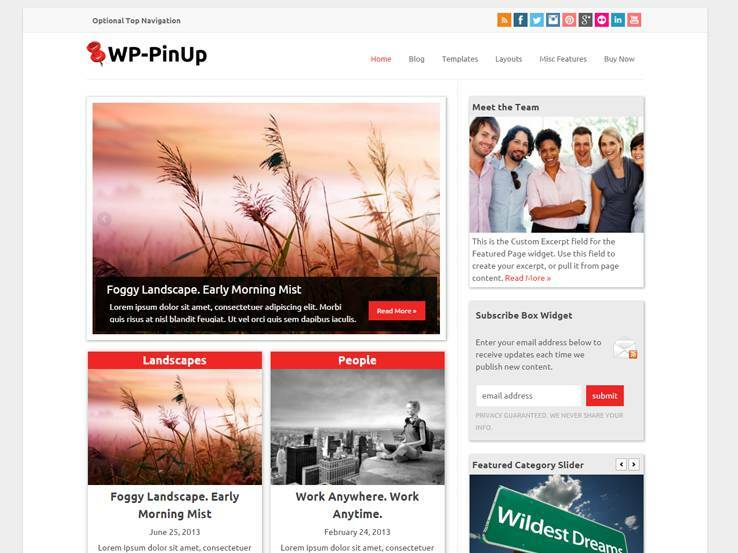 The WP-Pinup WordPress theme is a solid choice if you like grid-based layouts. 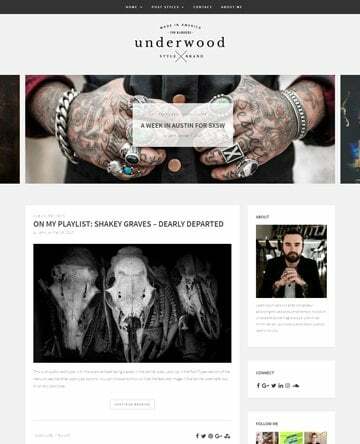 It’s a premium theme with a responsive design, utilizing somewhat of a Pinterest-style setup to the left hand side. This grid system showcases all of your blog posts on the website, while the rest of the grid is comprised of other widget elements. This makes it simple to set your homepage up, and it also organizes the content in a professional manner. In the sidebar, you can have widgets like a subscribe box for bringing in more customers, along with a Meet the Team widget with a picture and details about the people who work for you. A featured category slider is provided as well, giving people an idea as to what topics you talk about on your blog. Along with contact info, a contact form, social media buttons, and a search bar, this functionality is all packed into the widgets, so that you don’t have to install a third-party plugin. This is excellent news, considering those plugins usually slow down your site anyway. Two spots support widgets, the footer and sidebar. However, the main content area is the blog feed. Since this is the case, it’s important to know that all of the blog posts have various formats to ensure you can share a variety of content with your audience. You may share a video post or a gallery with lots of pictures just as easily as an audio or written article. Regardless of what you choose, the featured images, video,s and most relevant description show up on the homepage grid. Therefore, visitors can quickly see what you’re talking about which encourages them to click through to read the full article. Along with that, the WP-Pinup WordPress theme offers some solid spots to post ads. The ad placements look like regular grids, blending in with the rest of the items.